Few figures in American political life have been as consistently wrong as often as John Kerry. The former Senator bet on every Communist leader and Middle Eastern tyrant he could find only to watch the wheels of history roll over his mistakes. And now as Secretary of State, Kerry is at it again. In between peddling a Syrian peace process that no one but him believes in, he took a break to peddle the even more discredited peace process between Israel and the terrorists. In a speech to the American Jewish Committee, Kerry invoked the litany of failures, "Madrid to Oslo to Wye River and Camp David and Annapolis", but urged his audience not to pay attention to history and “give in to cynicism”. "Cynicism has never solved anything," he said. But then again neither has the Peace Process. And while cynicism isn't likely to usher in an era of peace or grow money on trees, it offers you the power to extract yourself from bad situations instead of taking refuge in more of the same wishful thinking that got you into them. If you find yourself mailing your tenth check to that Nigerian prince, cynicism won't get you a 200 percent return, but it will keep you from losing more money. "Why should any Israeli start giving in to that cynicism now?" Kerry asked. Perhaps because it's been twenty years. Or because thousands of Israelis have been killed and wounded. Or because there isn't a single piece of supporting evidence to show that the other side is interested in any kind of final peace agreement. The only sure things that have come out of the Peace Process in two decades are terrorist attacks and increased demands by the terrorists. There has been no final status agreement for the simple reason that the terrorists can only get the best possible deal by never coming to an agreement. The longer they hold out, the better the offers that the likes of John Forbes Kerry extract from Israel are. And the offers keep getting better so there is never any reason to actually make a deal. Picture a desperate rug merchant dickering with a customer. The rug merchant always lowers his prices. The customer always lowers his bids. The deal can never happen until the price of the rug reaches zero or until the rug merchant decides that the price isn't worth selling at. And that is the thing that men like Kerry will never allow Israel to do. Israel can never stop bargaining and the Palestinian Authority never has to stop bargaining until the entire rug, all of Israel, is on the table. Since Israel can never make that offer and since its enemies will never accept less than the whole rug, the negotiations are doomed to a descending spiral in which the Jewish State's negotiators offer more and more in the hopes of settling the negotiations faster to avoid the even higher demands that they know they will face down the road, while the exact same calculation removes any incentive from the other side to settle because they know that the deals will be better down the road. The only way out of the spiral is for Israel to walk away from the negotiations for good, accepting that the penalty for permanently abrogating the peace process will be less than the eventual penalty for perpetuating the peace process. And that is what Obama and Kerry hedge against by talking up the benefits of peace. "The great enemy of the truth is very often not the lie; deliberate, contrived and dishonest, but the myth; persistent, persuasive and unrealistic," John F. Kennedy said. The mythology of the peace process is the enemy of the truth. Its "reassuring repetition of stale phrases" prevents what Kennedy called, "the difficult, but essential confrontation with reality." Kerry repeatedly calls for hope against cynicism, using stale phrases to perpetuate a mythology of peace with no basis in reality. Out of his mouth fall all the stale promises and threats that have been moldering for decades. "We can’t let the disappointments of the past hold the future prisoner," he says and you can hear the faint echoes of a thousand old speeches and smell the musty air of old banquet halls. All these are the enemies of the truth. And the truth is a simple thing. Kerry keeps speaking of peace negotiations between Israel and the Palestinians. But which Palestinians would those be? Nearly half of the population of the Palestinian Authority lives under Hamas rule. Hamas is arguably the legal government of the entire Palestinian Authority having actually won elections. Meanwhile President Abbas, the man whom Kerry would like Israel to reach a final status agreement with, was last elected in 2005. He is approaching the eighth year of his four year term. During his heavily hyped visit to Israel, Obama gave a speech in which he said, "The days when Israel could seek peace simply with a handful of autocratic leaders, those days are over. Peace will have to be made among peoples, not just governments." But that's exactly what Kerry is peddling. A worthless deal with a bunch of autocrats. If Obama really meant what he said, then he would have insisted that Abbas win a current election to show that he actually speaks for the residents of the West Bank and Gaza. It would also be a matter of basic practice for the entire question of Hamas and Gaza to be settled so that there is one unified Palestinian Authority to negotiate with, rather than two Palestinian states. And yet that's not on the table here. Anyone who proposes that a man who claims to speak for the Palestinian people should have been elected by them to higher office in this decade would be accused of cynicism and lacking in hope and faith in the mythology of peace. Obama’s failure to insist on that means that he knows the negotiations are worthless. The bigger Arab League peace plan that Kerry is proposing is equally worthless. Not only is it worthless in detail, but it's worthless because, as Obama said in his speech, it represents a handful of autocratic leaders. The proposal came from the Saudi King who has never run for anything, except perhaps a dessert tray. The Arab League consists of monarchies, tyrannies and a few elected governments that took a severe beating during the Arab Spring and remain unstable even after elections. Aside from the absolutely terrible terms of the agreement, there is absolutely nothing to show that the offer represents any popular will or mandate in the Arab World. 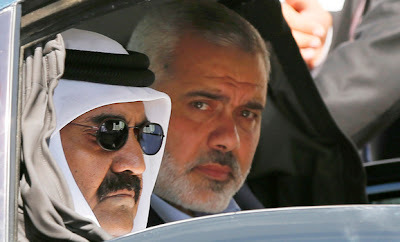 In 2010, John Kerry met with the Emir of Qatar who told him that the best way to resolve the Israeli-Palestinian conflict would be for Israel to give up the Golan Heights to Syria because then Assad could convince Hamas, Hezbollah and Iran to come to the negotiating table. The full phrasing of the Wikileaks cable is worth quoting here if only because it should serve to disqualify John Kerry from ever being allowed to negotiate anything, including his next yacht buy. "Senator Kerry told the Amir he knew Qatar could help the U.S. but asked how we deal with those who advocate violence. The Amir said the short answer is to work the Syrian track, which means pushing for Israel's return of the Golan Heights to Syria. The Amir said return of the Golan is important not just to Syria but also to Hizballah and Iran." The last time an American leader performed this well, he was sitting across the table from Stalin at Yalta. Kerry said that he had "great discussions" with Assad. The Emir told Kerry that Assad was committed to "big change". Kerry agreed that Assad wants change and peace with Israel. The Emir told Kerry that it's important that the United States pressure Israel into turning over the Golan Heights. 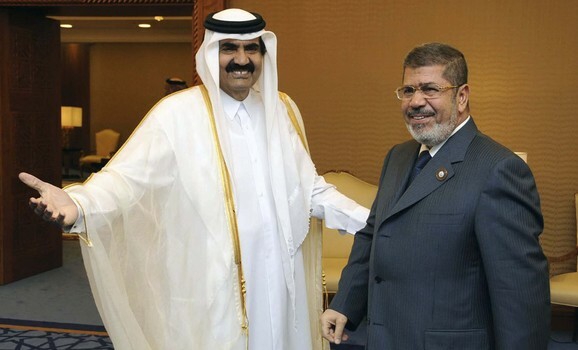 A year later, the Emir of Qatar was financing a Sunni war to overthrow Assad. Everything that he had told Kerry proved to be utterly worthless. There was no peace on the horizon. The Emir had only been using Kerry and Assad to weaken Israel, before using Hillary Clinton to weaken Assad. There was no peace here. Just the puppetry of diplomatic war. Kerry learned no lessons from this. If there is anything that Kerry has learned a lesson from in all his years of being played by everyone from the Viet Cong to the Sandinistas to Assad, it's impossible to tell. At the AJC, Kerry talked up the "moderate" leadership of Abbas, who had declared that he was no different than Hamas. And he doubled up on the mythology of hope. "People have spent so much time lamenting what hasn’t worked in the past that I believe we’ve actually forgotten to focus on what the future could look like if we do keep faith," he said. But it's actually the other way around. The creaky process has only dragged on this long because of all the people who insist on taking hope on faith, instead of basing their decisions on the solid ground of history.Who trade Patrick Henry's lamp of experience for rose-colored glasses. "Mythology distracts us everywhere," John F. Kennedy said. "In government as in business, in politics as in economics, in foreign affairs as in domestic affairs." The mythology of the peace process is a giant distraction. It allows for the same worthless commodity to be sold and resold, again and again. And that commodity is hope. The Israelis have been compelled to trade territory and lives for hope. Now the trade is beginning all over again, this time with a peace plan put forward by a country that is behind much of the terrorism around the world. Saudi Arabia and Qatar insist that they are American allies even while they fund terrorists who carry out attacks against America. In 2010, they were insisting that Syria could also be America and Israel's best friend if only it had the strategic high ground of the Golan Heights. And that once it had the Heights, then it could bring Hamas, Hezbollah and Iran to join the party. Now they're insisting that America has to destroy Assad and pressure Israel to give up half of Jerusalem to a terrorist organization and then there will be peace. The substance of John Kerry's speech was that he had learned absolutely nothing from the past and that everyone else should join him in not learning anything from the past. That optimistic ignorance is not a luxury that either America or Israel can afford. At the conclusion of his address, Kerry invoked the oath of Israeli soldiers at Masada. But the very point of the oath is the responsibility of the Israeli soldier not to allow his country to be put into a position where it is so besieged that its only choice is between the depredations of the enemy and an honorable suicide. And Masada, the final last stand in a desert fortress, is exactly where Kerry and the Qatari and Saudi devils whispering in his ear are driving the Jewish State. "Cynicism has never solved anything"
Yes, but it's prevented a lot of bad things from being set in motion. As a Vietnam-era vet, in the last 45 years I'm still looking for something good in John Kerry - but impossible to find anything substantial in an empty suit. Didn't have a venue for the following comment. While off-topic it is timely and does dovetail with much of the general nature found on this must-read site - minus the conspiratorial stuff of course. Not much of an advocate for conspiracy theories but when a large jet with 239 people on board goes missing and two passengers boarded with phony passports and both have the middle name Mohammed, I budge a bit. What this seems to imply is, a passenger with sophisticated tech skills could conceivably exploit the security vulnerabilities and gain electronic access to the aircraft control systems during flight. The teenager of the two Iranian Muslims was said to be carrying a gym bag and a laptop, while his 29 year-old cohort boarded with a suitcase. My first question would be who is the older guy and what is his educational background? Goat tending or computer science? The Iranians have been spreading computer mayhem of late and their hijacking skills would impress D.B. Cooper – at least in number. And Boeing? Remember the battery fires? They never did figure out the cause. They just modified the system and promised it would never happen again. Maybe the battery problems have been controlled by passengers with laptops. "But the very point of the oath is the responsibility of the Israeli soldier not to allow his country to be put into a position where it is so besieged that its only choice is between the depredations of the enemy and an honorable suicide"
Jeez, if Abbas ran for election on the West Bank, then Hamas would have the whole show. Daniel's decision to quote JFK to discredit Obama and Kerry is masterful. We are plagued by an infestation of liars and frauds who perch on the seats of power. Their aim is clear, to destroy the ability of free people to determine the course of their own lives. They are tyrants. They are imposing their will on free people everywhere. Their end is clear. They will be destroyed. At best their destruction will usher in a renewed commitment to the vision with which we have been blessed by our Founders. At worse they will be destroyed by more vicious tyrants. The choice will be made by citizens who either surrender their freedom for the stability of slavery or mount a struggle that will bring down this corrupt government in the name of freedom. never mind talking about the worthlessness of the current "peace process" between us and the palis. Let us talk about the real worthlessness of the "nuclear program negotiations" between the P5 and iran that is several quantums more perilous than any other diplomatic initiative we may discuss. We know that the constant smiles of ashton and the islamo fascist iranian FM will lead absolutely nowhere except buying time (the centrifuges are spinning 24/7/365) for the ayatollahs to achieve their ultimate aim of their terrorist state to acquire the a-bomb. BTW, how about some more "nuclear power" plants from the russians in busher? Talk about naive useful idiots (the eu's katie), where did she come from anyway? How does she justify her position and how does she explain her total ignorance of reality and her total ignorance of the position of her iranian adversary? Is she putting us all on? Beware of this smiling slimy european anti-semite. At the end of the day we will have to take action against the ayatollahs nuclear plants just like we took the magnificent action against the KLOS-C mass murder weapons smuggling iranian ship. A few days ago, Politico ran a piece with a headline referring to O's spine of steel, the article was mostly nonsense, but the responses were so virulently anti Semitic I was horrified, and left a comment saying as such. I am left to assume that Israel is losing the media war in America, sane and reasonable Americans are losing it too. As your article on Harlem the other day shows us, there has long been a huge anti Semitic streak in the Black community, does Obama share this because he believes it, or because the 'base' expects it ? He certainly has not been shy about taking a great deal money from Jewish donors. Jackie, have I missed something or did the coverage of the Iranian smuggling ship come and go in the blink of an eye in the msm ? John Kerry is the most INEPT and INCOMPETENT Secretary of State in the last 25 years. He is nothing but a SHAM BO WHORE-bama drone clone spokeshole, and puppet of the worst POTUS in US history. No foreign country takes the USA seriously, and certainly has NO respect for Kerry or his whore boss SHAM BO--especially Israel. The US has lost ALL credibility in the international community, and it will be years IF the US will regain its international standing--IF EVER...!!! Just like the Israelis have been compelled to trade territory and lives for a thousand and more years for a desert mirage called peace, when they’ve nurtured that desert into a literal garden, and have all they need in terms of education, business, and prosperity, and have allowed all people of all races and religions to live peacefully within her borders, why would peace offer them anything more? Likewise in America, people have been living in a garden of opportunity of all mixes of race and religion for several hundred years, with the ability to work hard and live a life equivalent to or greater than any emir or emperor who ever lived, yet HOPE and peace and all the fallacious scramblings inside the egoistic liberal mind bubble tell us we aren’t worthy, it’s unfair to prosper if another single individual on the planet is hungry, and we need to give up what we have – including history, to people who wouldn’t appreciate it if they got it. Just in time, a new Secretary of the Mind Bubble steps in, liberally denouncing history and what is, and announcing yet another government “peace plan” you didn’t know you needed. At last, everything will be transcendent and koom by yah. Does anyone here know if the origins of the so called 'Palestinians' are taught in history classes anymore ? Daniel, I didn't think anyone could make John Kerry look serious, but your critique of that time-proven fool was relatively flattering, for not recalling his devoted history of betrayal. That was kind of you, and probably unintentional, but any youth that might read your words, is unlikely to know his true record. He followed a bird-of-a-feather, Hillary, another ambitious, at any price, seeker of fame and preference. They've both traded their honor and integrity for the praise of a clueless media, a group history will ignore. Both sought what they considered the ultimate throne, and failed, yet still dream of that power. Why are the shallowest and least competent driven so hard to show their inadequacy. Poor judgement is demonstrated in all they attempt and happiness eludes them, as they lie and deny reality to please a shallower, fickle class of scribblers. That aside, my serious question to anybody is, Could Iran not afford to buy one or two nuclear weapon from Pakistan or N. Korea, for the price of one year's investment in their centrifuges and scientific underground facilities? Pakistan sold to N. Korea; why not Iran? I don't honestly see that Sunni-Shiite prejudice overcoming hard, fungible cash, for all these years. What concerns me more than the actions of Kerry and the U.S. government toward the Palestinian problem are the actions of the Israeli government. Clearly it would be in Israel's best interests to simply walk away from the so called peace process farce. However, like the proverbial battered spouse Israel keeps returning for more battering. Liberals are devoted to theories, philosophies and causes which are always opposed by reality and reason. Everything about the Left is informed by cowardice, corruption, lies and fantasies. Leftism is a deadly social pathology that has resulted in our government becoming the deadly enemy of its own country. It has metastasized to the point that we actually have an overgrown-adolescent, affirmative-action parasite currently defiling the White House. The only way for Israel to have peace is for them to unilaterally expel all Palestinians from the West Bank and Gaza. Then those places are annexed. Similarly, the only way for the United States to recover from the deadly disease of Leftism is to expel the vast majority of nonWhites. That will require and facilitate the dismantling of the entire Leftist edifice, which has in any case been utterly discredited. All that's left for the Left is force. Sophie: I'm not sure. To be perfectly honest, I don't know what the Palestinians are. All I know is that they're Arabs living in Gaza. Gaza...Does Israel want re recapture its land or surrender it? I've asked on other blogs and I've yet to get an answer as to whether Israelis want the land back. watching all of these so-called peace treaties is like watching the slow death of a nation. Personally, I think Israel should simply walk away from the table, not be a doormat. The proposal came from the Saudi King who has never run for anything, except perhaps a dessert tray. I had a cynical idea for Israel. First, devolve the IDF to a paramilitary. Then tell the terrorists that you accept a one state solution. Then wait for the first terrorist attack and use the IDF paramilitary (Neo-Irgun?) to expel the terrorists and their supporters (like 80% of the Arabs). Another cynical idea is to take over Jordan, install a puppet, have him grant the Yesha Arabs citizenship, and then give them residency like in Dani Dayan's plan. Another cynical idea is to grant them residency with a path to citizenship or a path to deportation to Gaza, depending on behavior with stringent requirements. You could get rid of the 80 percent hostile Arabs by deporting them to Gaza.